One day In class Mr.Harbeck was teaching us about fractions and how 2 fractions can be the same, but one is more precise. They both look the same. 2/3 is 4/6 simplified. One is more precise. 4/6 is more precise than 2/3. That is true because if you were to turn those to fractions in to decimals ... it would be.. 0.6666667 ( 2/3 ) and.. 0.66666667 ( 4/6 ). 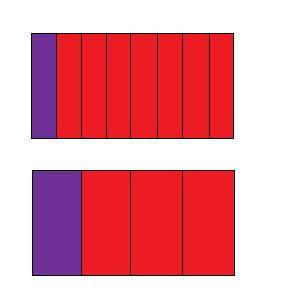 4/6 is more precise because it has more place value. 1/4 is obviously bigger than 1/8 ... but why ? 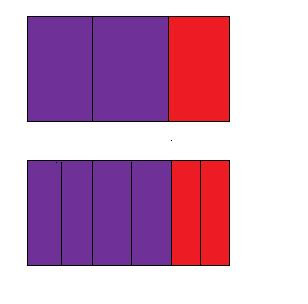 If you look at the picture above , 1/4 is a bigger portion than 1/8. When you look at the denominator you see that 8 is bigger than 4 , so many people might think that 1/8 is larger than 1/4. But when you look at a fraction... the lower the denominator , the bigger the piece. What would you rather have.. 1 of 4 slices from a pizza or 1 of 8 slices from a pizza? 1 of 4 right? Because its cut into less pieces which makes each piece bigger. I really liked your use of colour and how you presented your information. It could help if you explained it more throughly, and if you got rid of some of the extra space. But other than that, I think you did a great job! !